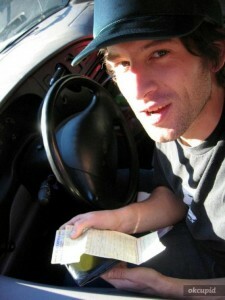 Ethan Indigo Smith – We have analytical minds with mediated wants which promote us to live highly complex lives. And yet, underneath it all we all crave simplicity, but are led to believe it can’t be obtained without further complexity. In fact, it is simple to be simple – and it’s completely up to you. For many, simply being present in the moment can itself be difficult. Statistically the thing most people do to relax is watch television, which takes the emotions and thoughts away to distant dramas and sitcoms; far away from the here and right now. As a culture we are used to becoming distant and distracted as a form of “relaxation” – and watching television is only one of many things a busy mind will do so as not to have to face itself. While typical modes of relaxation take us away, meditation brings us into the present. It is at once energizing and relaxing, bringing us closer to ourselves. It creates the space within us where we can explore the metaphysical links between our wandering thoughts and emotions, and our physical presence. (As you meditate try to be present and remember that the physical is always in the here and now.) It shows us that true power is within ourselves, not some unattainable outside force. It is an invocation of inner peace. And it is available to all of us. As consciousness vehicles, we were biologically wired to meditate and to benefit from meditating, as much as we were designed to walk. Like learning to walk, it can be challenging at first. There are stages of meditation which involve facing inner aspects of ourselves – our shadows – which can be just about the most difficult processes one can undergo. The longer one has been distracted from self, the more difficult it potentially may be. But, once we find our balance, meditation becomes second nature. Initially, being mentally and emotionally present can be confronting. The access to the power of the mind is nearly always clouded by life’s desires and traumas, so when we remove ourselves from distraction and engage only in our deepest consciousness, we may experience an influx of unresolved thoughts and feelings; the traumas (past) and fears (future) of life may come into our consciousness, seeking to be cleared. Before we are able to fully access the power within, we must face the darkness. We may feel that this takes us farther away from an immediate sense of peace, yet we can only achieve peace in the long-term if we acknowledge and resolve the thoughts and feelings that continue to arise in our consciousness. Know that the clouds of desire and trauma, now acknowledged, will clear over time, and allow those thoughts to pass through your consciousness as you return to the serenity of the present moment. The idea of perfecting meditation and meditative movement can also be intimidating to some, but like any new skill, practicing simple meditative movements will lead to quantifiable and noticeable reward. Release your ego to the process of betterment. It is always better to perform simple practices than not to practice at all. You can begin by doing any number of each Rite that you feel comfortable with – just try to do an equal number of each – and see for yourself. Remember: In life and art, simplicity is beautiful. In meditative movement, simplicity is powerful. It does not lead to mediocrity, but to mastery. Meditation is the most important aspect of meditative movement. Within all meditative movement or still meditation, there is mental movement, beginning with an imagination shift into a mental state of being that one cannot see physically. In meditation, it is the power of consciousness which holds the real potential and power, and which requires real cultivation. Because of our physical predicament as human Beings, requiring sustenance and satisfaction, ever subject to distraction and desire, meditative monks seek retreat in order to develop their spiritual potential. They understand that consciousness is unfathomable and boundless, and that being in quiet solitude is optimal to fostering a connection with that unlimited consciousness. Accessing the power of consciousness requires mental, physical and spiritual development, and solitude is extremely important to this. Much of life can be distracting and upsetting to the mind, which is why meditation practitioners and monks go on isolated retreats to monasteries of sorts, or forests or caves, or take vows of silence, or just seek quiet places to meditate undisturbed. They understand that consciousness is unfathomable and boundless, and that being in quiet solitude is optimal to exploring a connection with that unlimited consciousness. Choosing moments of isolation (particularly within nature) aligns our conscious to a natural state that brings us inward – where the real power, insights and inspiration reside. I subscribe to the Pareto principle of meditative movement, that is that the simplest movements are often the most beneficial. And it just so happens that one of the quickest and simplest sets of meditative movements and one of the easiest to integrate as your own, is also one of the most powerful. If you have never experienced the Five Tibetan Rites of Rejuvenation, I beg you to do so. Both invigorating and relaxing, it is a vigorous series of breath coordinated movements and meditation. The practice helps one be balanced mentally and physically, and has been known to help treat depression and inflammation. It takes about twenty minutes or so depending on how long you meditate, the longer the better of course. There are 5 movements, each done 21 times, Each of the Tibetans are followed by taking two deep breaths so as to balance out the energy just moved. Each of the Five Rites are shown in the visual below. • The first Tibetan is simply spinning clockwise with the arms active to the sides. The first Rite is done clockwise in unison with the sun for the chakras are said to spin clockwise. When held up such activates and opens up the arms, shoulders and neck. Try going extremely slow. 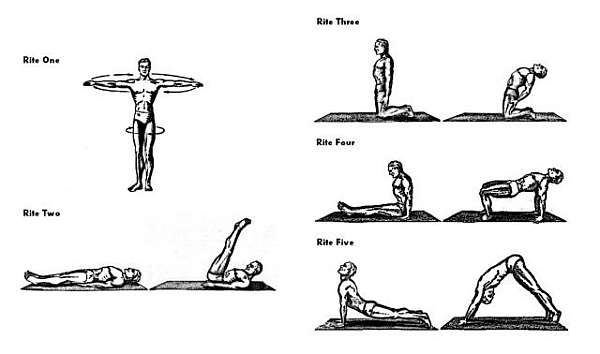 The Five Rites strengthen and activate the abdominal area and neck. These areas are considered the most problematic and energetically clogged (the Rites open up the chakras). Then take two deep breaths. Hands are at your hips. Take a deep breath through your nose and exhale through your mouth with lips shaped in an O like Superman blowing out cold air. • The key to the second Tibetan is to lift up and set down the legs and neck in unison. Each Tibetan is done in unison with the breath and as with all meditative movement, the inhale is tension/activation and exhale is relaxation/release. So each movement begins with inhale and returns with exhale. The easiest way to count is to count 1 on the inhale and 1 on the exhale, counting each twice so you are less likely to lose track. • A trick with the third Tibetan is to think about using your hands as support and about bringing bring your back so that it returns to being perpendicular or just slightly past perpendicular, a degree or two forward. Go slow. • The key to the fourth Tibetan is to initiate the movement with your neck opening the throat chakra. • As you progress you will eventually be able to do the fifth Tibetan with opened joints and ligaments doing Hindi pushups where your face glides along just above the floor and then rises up, like a cobra, on the return/release. For those who practice The Five Rites already, here are five nuances, one for each movement that can help and enhance one’s practice. • The nuance for the first Tibetan is adding walking the square to spinning in a circle. Walikng the square makes a four step complete rotation. One steps ninety degrees with each step creating square one traces the perimeter of with each circumnavigation. • The nuance for the third Tibetan is to of course move gently, aware that Rite 2 prepared the back for the extreme camel position variation movement, holding the hips together with the thumbs extending around so to keep the hips, pelvis and lower back together as you flow. • The nuance for the fourth Tibetan is to push through the heels, but otherwise relax your legs as you use you abdominal strength to lift. This opens up the knees as you flow. • The nuance for the fifth Tibetan is to come into and leave the cobra variation position with your back set in a way so that it is pushing upwardly as if ready to hop into a crane posture. I like to practice the Five Rites slowly, to develop a deep breath cycle. One way to include a breath control ‘work in’ along with doing the Rites is to breathe only with the movements. Whether you do 5 of each or 21, his can generate tremendous chi and breath potential. As with all meditative movements, part of the reason people are adverse to beginning it – part of the reason we allow our ego to convince us we do not need to do such practices – is because we see that they take time and effort. But remember, meditative practice makes time. It gives you more energy and focus, and as a result, more efficiency. It actively invokes peace and simplicity. And best of all, it’s completely up to you. A book by author Ethan Indigo Smith. 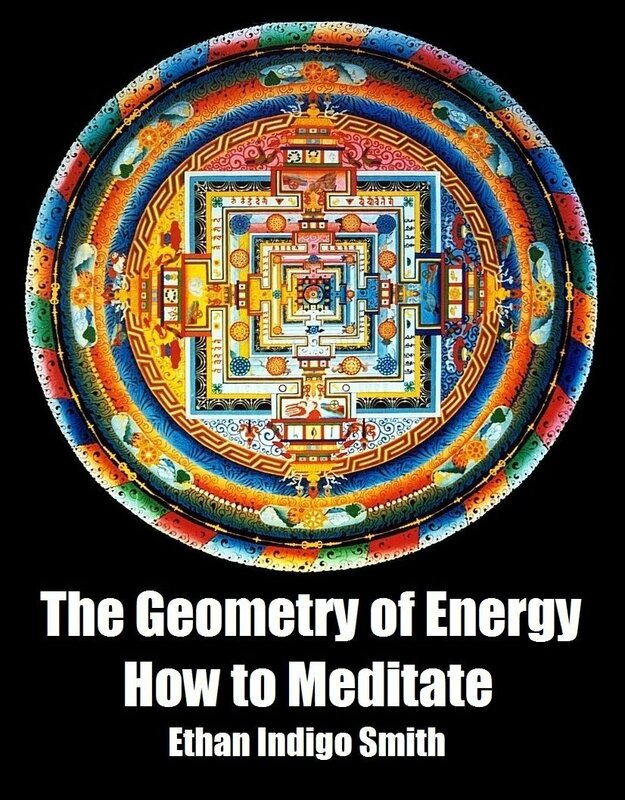 Author Ethan Indigo Smith’s latest book, The Geometry of Energy, explores meditation and meditative energies through the sacred four dimensions of geometry. Simple and profound, it is an empowering four-step meditation designed to lead to individuation, self-development, an enhanced understanding of energy, and psychological and spiritual cleansing. 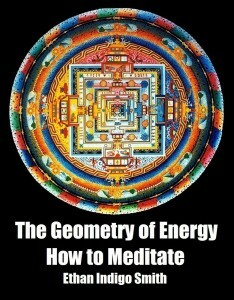 The Geometry Of Energy: How To Meditate is available here on Amazon. Activist, author and Tai Chi teacher Ethan Indigo Smith was born on a farm in Maine and lived in Manhattan for a number of years before migrating west to California. Guided by a keen sense of integrity and humanity, Ethan’s work is both deeply connected and extremely insightful, blending philosophy, politics, activism, spirituality, meditation and a unique sense of humour.